NASA’s OSIRIS-REx spacecraft executed its first Asteroid Approach Maneuver (AAM-1) on Monday putting it on course for its scheduled arrival at the asteroid Bennu in December. The spacecraft’s main engine thrusters fired in a braking maneuver designed to slow the spacecraft’s speed relative to Bennu from approximately 1,100 mph (491 m/sec) to 313 mph (140 m/sec). The mission team will continue to examine telemetry and tracking data as they become available and will have more information on the results of the maneuver over the next week. During the next six weeks, the OSIRIS-REx spacecraft will continue executing the series of asteroid approach maneuvers designed to fly the spacecraft through a precise corridor during its final slow approach to Bennu. The last of these, AAM-4, scheduled for Nov. 12, will adjust the spacecraft’s trajectory to arrive at a position 12 miles (20 km) from Bennu on Dec. 3. After arrival, the spacecraft will initiate asteroid proximity operations by performing a series of fly-bys over Bennu’s poles and equator. 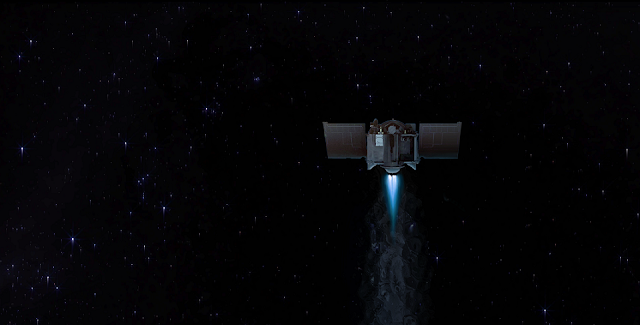 The Origins, Spectral Interpretation, Resource Identification, Security-Regolith Explorer (OSIRIS-REx) spacecraft travels to a near-Earth asteroid, called Bennu (formerly 1999 RQ36), and is expected to bring at least a 2.1-ounce sample back to Earth for study. The mission will help scientists investigate how planets formed and how life began, as well as improve our understanding of asteroids that could impact Earth.